One of the biggest challenges for healthcare organizations is to deliver care to patients with multiple chronic conditions. In addition to being the most challenging population to manage, they also are the costliest. While they make up only 5% of patients, they account for up to 50% of all healthcare spending. Focusing on the most complex and highest cost patients, the eIAC program (Intensive Ambulatory Care) is designed to support chronically ill patients to manage their condition at home. The eIAC program enables all stakeholders in the clinical and social management of a patient to identify and address the root causes of the patient’s frequent admissions. This creation of a cohesive system of care will help to reduce hospital admissions while providing the highest level of care to patients with complex, and multiple chronic conditions. The eIAC service proposition combines leading telehealth technologies that monitor and educate patients with a patient portal (eCare Companion patient app). This transformed clinical model unites former factionalized care team members by using the eCare Coordinator software platform to enable clinicians to remotely monitor patients and make informed and timely decisions. The program enables the transition to patient-centered, cost-effective, proactive health management while supporting pay-for-value care delivery. The Intensive Ambulatory Care program represents a step forward in managing healthcare costs and improving the lives of individuals living with multiple chronic conditions. By engaging patients in their health while caring for them from their own homes, the program introduces new ways of managing healthcare costs while simultaneously improving quality of life. “The results of our at-home telehealth pilot with Philips have been dramatic and are indicative of the exponential success such a program could have by engaging patients in their own care and building a strong support system around them,” said Dr. Hargobind Khurana, senior medical director of Health Management, Banner. “As we continue to expand this program, we anticipate seeing further proof that telehealth proeIAC / Intensive Ambulatory Care program Care delivery re-imagined for the most complex, highest cost patient populations through telehealth. By Philips Design for Philips Hospital to Home grams can address readmissions rates, reduce costs, and improve the health and quality of life for patients with multiple chronic diseases.” says Khurana. Tailored communication strategies to patients throughout the service. Getting to know the members by a holistic patient assessment. Patient engagement through coaching (personal and virtual). Patient portal and teleconsultation with the multidisciplinary team. Population health tools for health professionals. Gathering clinical data through remote monitoring. We have used a wide variety of design tools during different stages of the project, including: value network maps, personas and familias, stakeholder landscape, experience flows, scenarios and storytelling as well as experiential prototypes of different service touch points. The Philips design team followed a multi-disciplinary co-creation process. 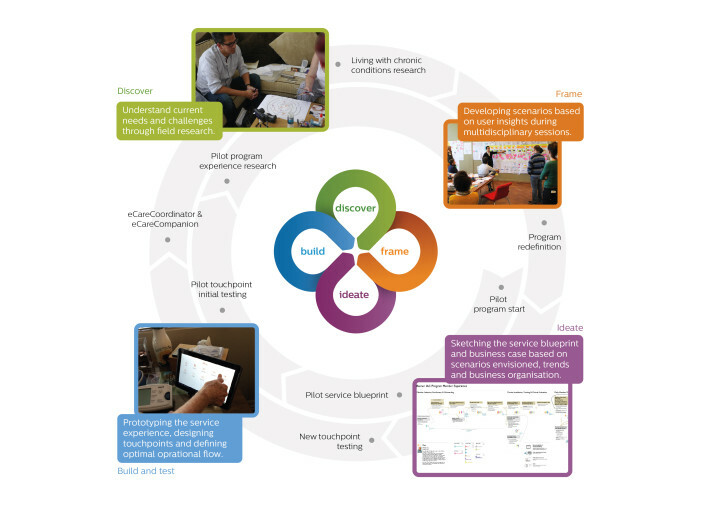 The combined knowledge of clinicians, business experts, analysts, developers, researchers and designers contributed to the eIAC service proposition from their respective viewpoints using service blueprinting techniques and participatory design workshops. 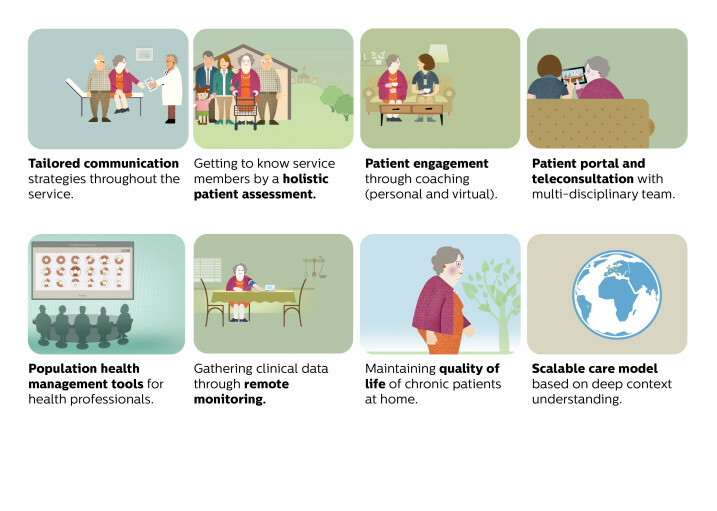 By combining this multi-discipline prototyping with the latest telehealth technologies and extensive patient research, the Philips design team created a radical new clinical model. The outcome was a model delivering a cost-efficient concentration of collective effort to the small number of chronically ill patients who previously monopolized the majority of a medical system’s resources and funds. The approach embraces the essential principles of Design Thinking in an iterative fashion: discover, frame, ideate and build. A. Discover Getting insights into the needs, challenges and motivations of people’s lives by immersing ourselves in context at home and at the hospital. Alongside this, learning and digging into research and information that already exists in literature. This allowed us to better understand all the challenges and opportunities that exist based on a good understanding of the way care is currently provided to patients with complex chronic conditions at home. B. Frame The next step is to frame the opportunity areas based on the ‘as is’ situation from the Discover phase. We analyze key trends in different domains such as Technology, Healthcare systems and Socio-cultural aspects to envision an alternative future scenario. Once we have fully analysed the data and framed the challenge, we move into Ideation where we use various divergent and convergent thinking tools to guide the team and ensure we generate targeted solutions. C. Ideate Based on a good understanding of the challenges, and having framed the opportunity areas with a clear value proposition for the several stakeholders involved, we try to find solutions and ideas that support the service (or aspects of the service) already envisioned. We circulate these ideas to create a shared understanding and prioritize the aspects of the service we aim to build and test. D. Build and test Finally we start building and prototyping, simulating behaviours or desired experiences to test our hypothesis. We deliberately produce low fidelity prototypes so we can learn from the feedback in testing, perhaps reframing the problem and feeding that back into the Discover phase for another round. In the context of the pilot phase for the eIAC program, we have done this in close collaboration with Banner Health by following a truly collaborative and iterative process towards our objectives of improving patient experience, achieve positive clinical outcomes and reduce financial costs. Reduced costs of care by 27%. This is driven by a reduction in hospitalization rates, days in the hospital, plus a reduction in professional service and outpatient costs. Reduced acute and long-term care costs by 32%. This is driven due to a significant decrease in hospitalizations. Workflows have been researched and redefined to support care organization processes, enabling efficient use of existing resources. Collaboratively-designed clinical tools now facilitate remote managing of complex patient populations. The eCareCoordinator software platform allows a variety of care team professionals to remotely monitor patients’ vital signs. Operational support and training enables the clinical team to help care staff to achieve the clinical and financial benefits sought by the parent organization. Reduced number of hospitalizations. Evidence shows that eIAC users have significantly less hospitalizations in comparison with those patients not using the eIAC program.